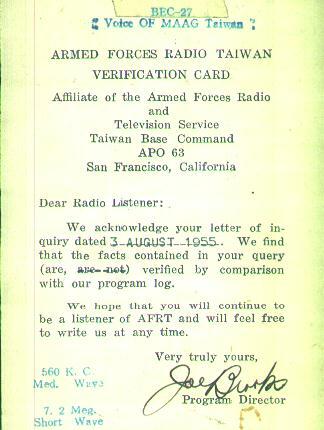 QSL card from Armed Forces Radio Taiwan for report of 3 August 1955 on 7.205 mHz. Power was 100 watts. 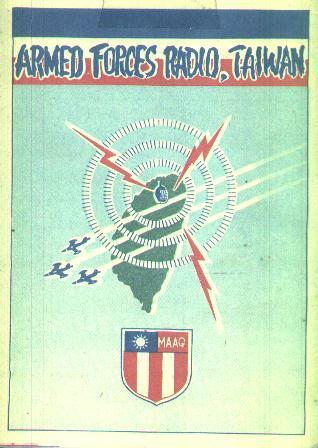 The United States Armed Forces had a rather sizeable contingent of troops stationed in Taiwan until the time when the U.S. recognized the Peoples' Republic of China and ceased ambassadorial relations with the Republic of China. This station was part of a world wide network providing American entertainment, news, and sporting events by radio for American forces overseas. At the time, similar shortwave stations were located in Korea (Radio Vagabond), Japan (Far East Network), and the continental U.S. (Armed Forces Radio Service).